joy magnetism: Toro, toro, toro! My friend brought this back for me from Barcelona a while ago, and I had to do a little research to figure out what it was, besides a vintage bullfight poster, and a cool one at that. Here's what I found: Plaza de Toros Monumental is a bullring in Barcelona - and it's gorgeous! Built in 1914, it seats a good 19,500 people. I saw somewhere that the city of Barcelona is officially against bullfighting, and this ring is the only place you can actually see a bullfight in town. While you're there, you can check out the Museum of Bullfighting as well - apparently, it's filled with costumes and heads of famous bulls (sniffle) and various bullfighting paraphernalia, like tickets and posters, etc. 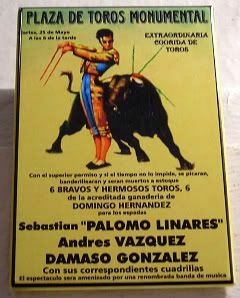 This vintage fight poster actually calls out one of the greats in the sport, Sebastian "Palomo Linares" whom you can see here, later on in life, I believe. Even though bullfighting can trace its roots back to prehistoric times, I really can't figure out if it's something that I'd want to see in person or not. Second, while I'm sure it takes great skill to avoid being gored by the bull, it always just seems really mean to be tossing that red cape in front of them, trying to get them to charge. I can't guarantee that I wouldn't be on the bull's side, ya know? Still, today's magnet is supercool, and now I've learned a little bit about the sport. That's probably for the better, given that all I really knew about bullfighting, I learned from Harvey Korman in Herbie Goes Bananas, circa 1980, where Herbie finds himself smack dab in the middle of a bullring in Mexico, trying to fend off a big bull, and the bad guys, all at once. Such a great movie! Oh, I know Bananas is one of the most deplored of the series, but it's still one of my favorites. And, c'mon. Who doesn't love a good Herbie movie?